Good morning! Sorry for the silence yesterday, but Sunday night's Super Bowl party went much later than planned and I just wanted to sleep when I got home. However, we had a great time and these cookies I made were a hit. Who knew that cake mix, light cool whip and an egg would make something delicious? Anyway, I'm back and I have a little shopping dilemma of my own. You see, one of my talents is that I can justify almost any purchase. (This may also be a weakness, I hear.) However, on Saturday I found a deal that took me by surprise. 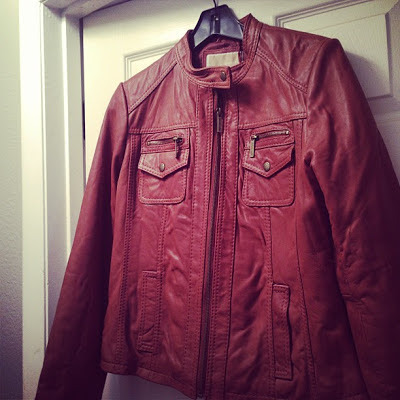 I was shopping for casual dresses at Nordstrom Rack, and right there on the rack was a tan leather moto jacket in my size for $200. And it was made by Michael Kors. And it fits. I shop too much to think that these deals are common, so of course I bought it for fear of regret later, but now I'm on the fence because I really wasn't planning on spending 2 months of my shopping budget in one go, and it is 95% perfect. I wish I did not have chest pockets, but I can live with them since the other options I found are all $300 or more. I will also need to get the sleeves taken up about 2.5 inches. However, I find myself wondering if I'll really wear it as much as I think I will, not because of my own imagination but because of weather. Here in Texas, jacket weather doesn't really get going until November and we're back in shirtsleeves in March. However, I also do not have a light jacket at all, and usually wear a zip-up fleece even when it doesn't look great. Don't get me wrong, I could make all kinds of outfits with this jacket, but I mostly go to work and the gym, so I'd end up carrying it around or hanging it up in my office. What would you do? Accept this gift of good fortune from the shopping gods or take it back and save money for warm weather clothes I can wear from April to October? I think I wanna keep it.